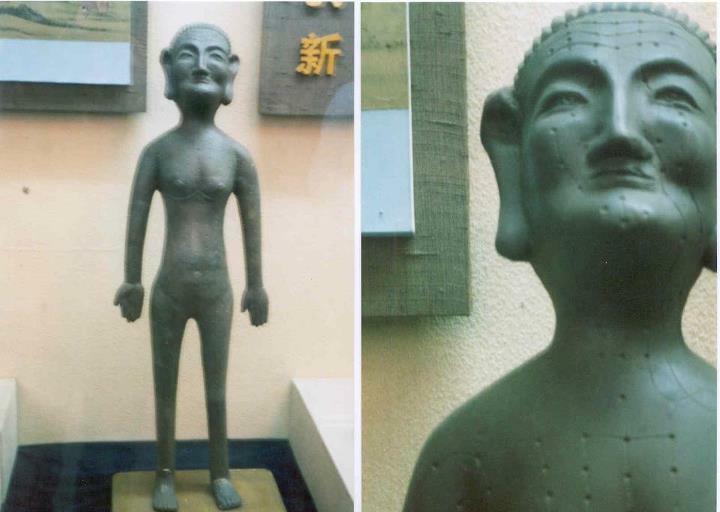 A traditional stone acupuncture model taken from a Chinese Medicine Museum in Shen Yang, China. Acupuncture is one of the many modalities within Traditional Chinese Medicine. It involves inserting extremely fine, sterile, single use needles into the body at specific points. These locations have demonstrated to be effective in relieving pain or for the treatment of specific health issues. An acupuncture treatment generally comprises multiple therapies and can include cupping, spooning and moxibustion (burning of the dried plant Mugwort) as well as acupuncture needles. Acupuncture is based on the concept of Qi or energy that flows through meridian pathways along the human body. These pathways are interconnected with the various internal organs at a deeper level whilst on a superficial level form the traditional Meridian system. These pathways include points that the Chinese have mapped and observed over a period of 2,000 years. The system of Traditional Chinese Medicine is based upon concepts that are pre-scientific, they pre-date modern scientific thought. This is why when discussing acupuncture or Traditional Chinese Medicine we still use the ancient terms relating to the practice. It does not mean that the system is not scientific, more that it is still a traditional therapy based on the traditional concepts. These concepts can be looked at philosophically as an overlay for the human body and a tried and tested method to determine the treatment method, protocols and acupuncture points appropriate for each individual coming in for acupuncture. Traditional Chinese Medicine understands that everything is composed of two complementary energies forces – Yin and Yang. Traditional Chinese Medicine identifies that disease can be caused by an imbalance with these two forces within the body. The insertion of needles at the appropriate location is said to restore balance with these forces and help return the body to homeostasis. Acupuncture adjusts the flow of Qi in the body leading it to areas where it is deficient and draining it where it is excessive or stuck. In this way, acupuncture restores the harmonious balance of the body and its parts.